It can be hard to find good Tex-Mex style food in Korea when you’re craving a burrito or taco, but luckily Seoul and some other cities have some good offerings. Today we’re going to visit Los Amigos in Itaewon. Itaewon has several good places to choose from, but my friends and I usually go here because we know they’ll have seating available. Taco Amigo is also very, very good (I believe the owner told me once that they cater to some of the South American and Central American embassies quite often), but the storefront is very small and it can be hard to get a seat at the time my friends and I eat lunch together. So, anyway, Los Amigos! No, I’ve never been to the “meatpacking” restaurant so don’t ask. 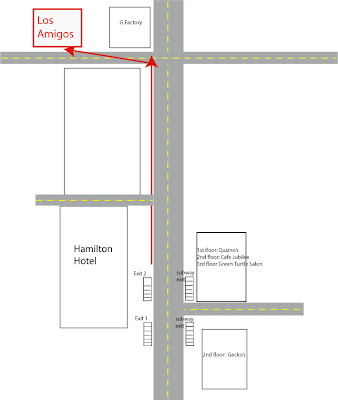 Los Amigos is located on a side road towards Hannamdong from Hamilton Hotel. 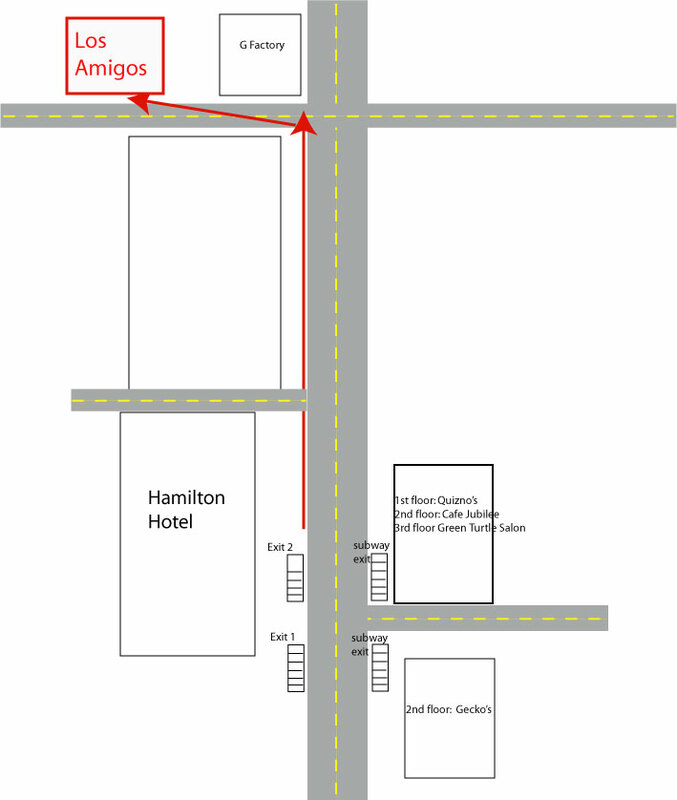 So, if you turn with Hamilton Hotel on your left and walk down the street until you hit the first full crossroad then turn left, you’ll see it just up the hill on the right side of the street. So, at Los Amigos, you can get burritos, tacos, quesadillas, chimichangas, tostadas, and several other dishes including vegetarian options. Meat options typically include chicken or beef and sometimes shrimp depending on the item. I usually get chicken, Marianne and Justin usually get beef, and Denise gets vegetarian options. We’ve all been pretty pleased with our food. The chicken is seasoned enough to give it flavor but not make it too overbearing. I can’t remember the prices right off hand, but they’re typical of foreign food in Korea: an average of 13000 won – 15000 won per dish maybe? The sides with the meal are typically beans and Mexican rice. The rice is quite good (frankly, I'm surprised it's not just flavored with ketchup), but the beans leave something to be desired. I can’t quite place what type of bean they are, but they aren’t black beans and they aren’t pinto beans. I want to say they’re kidney beans, but I may be mistaken. For appetizers, the items are kind of a hodgepodge – we usually get the onion rings, which is weird, I know. The onion rings here are pretty good, though, along with the horseradish dipping sauce they come with. The service is good and they are attentive and patient. They also have servers that speak English, so don’t worry about ordering (the menu is also in English). They have booths and table both available; however, the booth seats are kind of hard to scoot across since they kind of sink down. One thing that is kind of annoying is they have bicycle horns hanging above the tables to use to get the server’s attention instead of the little buzzers on the tables. The horns are very, very annoying since Koreans have no problem using them for every little thing. And, um...food. I can't remember what this was.